(1) Who stays? Who goes? The trade deadline and whether the Brewers will sell in a meaningful way will be an omnipresent and, likely, irritating discussion over the next two-and-a-half weeks. Twitter will be aflutter with tweets about players increasing or decreasing their trade value based on 25 plate appearances, a trio of relief appearances, or a pair of starts. Player values are established by this point. The only things that will change a player’s value over the next two weeks are his health and price tag. Still, the upcoming 16 days will hint at the long-term direction of the franchise, whether the club is willing to engage in a full rebuild or simply try to remain fringe-relevant in hopes of making a low-probability run at the postseason. It will only hint at the team’s blueprints for the future, though, as holding many of their most valuable trade chips does not necessarily indicate an unwillingness to sell. The winter’s trade market may prove more larger and more profitable for the Brewers, if they ultimately wait to shop guys like Carlos Gomez, Jean Segura, and Jonathan Lucroy. At the same time, I do think the upcoming trade season can serve as a barometer, on some level, of the team’s direction. Some rumblings about owner Mark Attanasio’s unwillingness to engage in a full tear-down of the club have bubbled to the surface over the last three months, and perhaps there is some truth in those rumors. I also believe that, as a businessman, Attanasio has legitimate qualms about an intensive rebuilding project in Milwaukee. Unfortunately, though, a quiet trade deadline doesn’t guarantee that the Brewers are unwilling to thoroughly rebuild the roster. The upcoming offseason will be the true litmus test. Just don’t expect that latter fact to stop most people from panicking, if the team fails to make many moves before July 31. (2) Will Taylor Jungmann continue to show a level of command that’s unprecedented in his career? Through seven starts, Taylor Jungmann has won four decisions and posted a 2.15 ERA. His 2.45 DRA (Deserved Run Average) further indicates that his success is reflective of true talent, rather than a stretch of good luck. Watching a few of his starts — particularly his recent complete-game gem — it’s obvious that he’s on top of his game. He’s spinning the breaking ball better than he had in the minors and is relying on his sinker to generate a 55.5 percent ground-ball rate. Moreover, he’s pounding the strike zone better than ever before. That has been central to my hesitation on Jungmann’s future role with the club and why I’m not ready to consider him as anything more than a potential fifth starter or swingman. It’s not a BABIP-based argument that cites his .252 BABIP and naively calls for that to regress to the mean, though that seems likely since he’s only had a BABIP under .300 once in his four minor-league seasons. Instead, I’m skeptical that Jungmann can continue to throw strikes at this high of rate. In general, players do not suddenly perform at career-best levels after making the most difficult jump in professional baseball, from Triple-A to Major League Baseball. Jungmann has somehow altered his profile, from a ground-ball specialist who struggled to pound the zone to a ground-ball specialist who has a stellar walk rate. It’s certainly something that could have happened. I mean, Dallas Keuchel had a career ERA over 5.00 before magically becoming a legitimate ace. But, again, it’s about probability. When projecting future performance, should we bank on Taylor Jungmann being an anomaly who suddenly (and unexpectedly) figured it out in the majors? There’s a small chance that’s the case. I’m just not ready to put my money on that. (3) Can Jeremy Jeffress step up and claim the “closer of the future” title? After getting shipped from Milwaukee to Kansas City to Toronto, former first-round pick Jeremy Jeffress has returned to the Brewers and has transformed himself into a quality reliever. That’s hardly the end-goal when drafting a prep right-hander with the 16th-overall pick, but a useful relief arm seems to be a desirable consolation prize for the organization. Jeffress has compiled ERAs of 1.88 and 2.95 over the past two years with the Brewers, respectively, continuously gaining the trust of Ron Roenicke (then) and Craig Counsell (now). He has seen the most high-leverage appearances of any Brewers reliever, aside from K-Rod, and has the second-most shutdowns (13) on the club. Although Will Smith and Jonathan Broxton are the team’s co-called “set-up men,” the Brewers have actually employed Jeffress in key situations more often. The 27-year-old’s emergence has wholly been tied to his improved control. Prior to his second stint with the Brewers, Jeffress had not posted a big-league walk rate below 4.35 BB/9 and was only two years removed from walking 8.78 batters per nine innings. With the Brewers, though, those walk rates have been nearly cut in half to 2.20 BB/9 and 3.18 BB/9, respectively. He features a heavy mid-90s fastball nearly 80 percent of time, so realistically, he mostly needs to fill up the zone with his two-seamer and get the opposing hitters to pound the ball on the ground — which can be seen by his 61.5 and 58.9 percent ground-ball rates over the last two years. Another issue that plagued Jeffress early in his big-league career was an inability to throw his curveball for strikes, which allowed hitters to sit on the fastball. Even a mid- to high-90s fastball can be crushed if opposing batters know it’s coming. As a reference point, Jeffress had never thrown more than 31 percent of his curveballs for strikes. The past two years, that mark has increased to approximately 40 percent. That additional threat is one of the reasons why his swinging-strike rate on his curve has jumped to 18.1 percent. Hitters now must honor it as a legitimate offering, instead of not swinging whenever they recognized the “hump” and spin of the curve. With relievers, though, it’s difficult to determine whether such improvements are sustainable or whether they’re just a small-sample illusion. The second half of the 2015 will go a long way towards solidifying the answer to that question. (4) Is Ryan Braun back? For all the post-PED handwringing that continues to surround Ryan Braun’s public perception, it’s possible that Braun has rebounded from suspension and injury to once again be one of the top offensive outfielders in Major League Baseball. His .835 OPS ranks 13th among all qualified outfielders, and that includes a dreadful start to the season in which he tried to break bad mechanical habits that he developed last year. If one looks at his last 66 games, Braun has compiled a .900 OPS with 11 stolen bases — an OPS that would rank sixth-best among all outfielders. Ample statistical evidence illustrates Braun’s re-emergence at the plate. Firstly, the 31-year-old is squaring up the baseball with regularity and the power has returned. His average batted-ball velocity is 93.69 mph, which ranks third-best in all of baseball — behind only Giancarlo Stanton and Yoenis Cespedes, and just ahead of Miguel Cabrera and Mike Trout. His .220 ISO is far above the .143 league-average for all hitters and the .151 league-average for outfielders. In other words, the post-PED power-outage argument has a significant evidence problem. Secondly, Braun has re-discovered his power stroke to left field.In June of last season, ESPN’s Buster Olney explained how opposite-field oriented Braun had become at the plate, even taking a non-subtle PED jab for good measure. His nerve injury in his hand made it difficult to keep his top hand on the bat, much less pull the baseball, so the six-time All-Star adjusted and began shooting the baseball to right field. 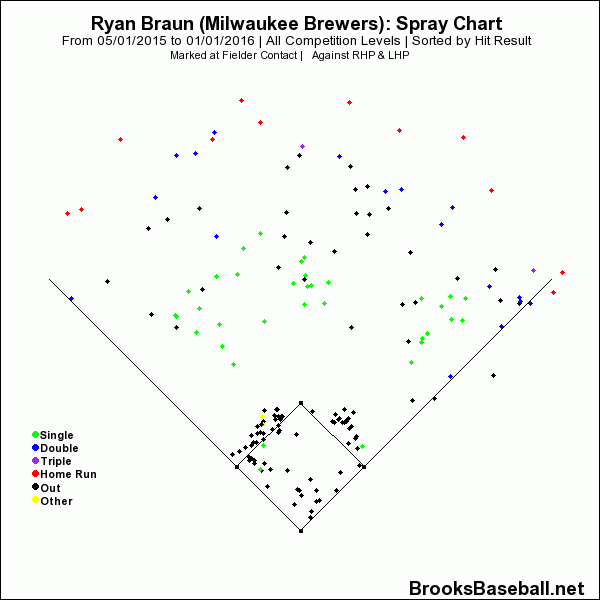 That muscle memory carried over into spring training and April of 2015, as Braun continuously shot baseballs to the right-center and right fields. That has changed in recent months. Since the beginning of May, Braun has begun to hit for power to all fields. This hit chart won’t show a paucity of balls being hit to right field — Braun will always be willing to use right field regularly — but it does show a half-dozen homers to the pull side of center. It shows a half-dozen doubles to the pull side of center. At the risk of being too reductionist, it shows the Ryan Braun of old. Finally, the Brewers’ right fielder has improved his contact rate and has improved his plate discipline. One of the biggest side effects of Braun’s nerve injury was the need to start his swing earlier to “cheat” against pitches in on his hands. That resulted in less time to identify spin, location and velocity, and as one would expect, that led to more swings at pitches outside the zone, fewer walks, and a higher swinging-strike rate. Correcting bad habits takes time, but it appears that after a rough few weeks in April, Ryan Braun has returned to his career norms. His contact rate has normalized. His walk rate has jumped significantly since last year. And while he continues to swing at more pitches outside the zone than before, it’s lower than 2014 and is truthfully a function of today’s game. In 2009, for example, the average major-league hitter swung at 25.1 percent of pitches outside the zone. This year, the average is 31.0 percent. In that context, we should perhaps expect that Braun’s number should be higher than his career norm. What’s important, though, is that Braun is pairing it with an above-average contact rate. As far as the rest of the season is concerned, Brewers fans could treat this argument in two ways. One could argue that the remainder of 2015 will (A) serve as Braun’s litmus test as to whether he’s truly “back,” in all the different ways that can be interpreted, or (B) be an opportunity to enjoy Braun’s return to form. After all, watching Ryan Braun at his offensive peak was aesthetically pleasing and should be going forward. For me, I lean toward the latter, but while acknowledging that the former remains valid until Braun is able to extend his body of work into a more convincing sample size. A half-season doesn’t define a player, no matter how much it feels like it at the moment. Remember when Cesar Izturis made the All-Star Game in 2005 on the basis of two strong months? (5) How will the starting pitching develop down on the farm? Guys like Marcos Diplan, Jorge Lopez, and Tyler Wagner have all taken steps forward in 2015 and have garnered ample attention; however, the organization needs to develop more depth within the system. Relying on mid-rotation free agents has proven undesirable and, largely, not cost effective. Cultivating homegrown talent for the rotation should be one of the primary goals for the Milwaukee Brewers over the next few years. Right-hander Devin Williams returned from injury a couple months ago and owns a 3.36 ERA for Class-A Wisconsin, but reports on his command have been rather poor — which is also reflected in his walk rate of 4.15 BB/9. He’s a guy who has begun to fly under-the-radar because the Brewers’ have handled him cautiously. Two years in rookie ball and this season in Class-A, the 20-year-old has only thrown 157.1 professional innings in three years. Still, he remains one of the most electric arms in the system. Taylor Williams and Miguel Diaz finished the 2014 instructional season as two of the most-exciting pitching prospects in the Brewers organization. They have yet to take the mound in 2015. Williams has dealt with forearm tightness all year and suffered a setback earlier this summer, while Diaz has been on the 7-day DL for the past two months. Injuries happen — especially with pitchers — but their absence is obviously hindering their professional development, and if Taylor Williams ultimately needs Tommy John surgery, he’s looking at roughly two years of non-production and potentially not returning to game action until he’s 25 years old. In other words, he’d be a year younger than Tyler Thornburg at this point and would have never pitched above High-A. That’s a tough profile about which to get excited. Finally, the Brewers need their 2015 draft class to sprint out of the starting gates. Right-hander Cody Ponce has dazzled with impressive performances in Helena and Class-A Wisconsin, but Nathan Kirby has yet to pitch a professional inning and Nash Walters has walked eight batters in 10.2 innings. While the best prospect in the draft class may be outfielder Trent Clark, the Milwaukee Brewers need their early pitching selections to establish themselves as legitimate prospects, which is a process that starts in earnest this summer. Good stuff. I am legitimately concerned about the future, Jim.